Fujitsu is looking to take a slice out of Apple's MacBook Pro with Retina display sales by launching a 14-inch Ultrabook with a super clear 3200x1800 pixel resolution display. Fitting, then, that the company claims its new Lifebook UH90/L is "emblematic of the slender, solid and iconic beauty of a Japanese sword". The new model gets its clarity from an IGZO panel manufactured by SHARP, which lends it a pixel density of 262 ppi (pixels per inch). Fujitsu says the display offers 2.7 times the detail of a full HD screen, rendering text sharper and photos more vivid. In comparison, the display edges that on Apple's top end MacBook Pro with Retina display model, which features a 15-inch 2880x1880 pixel resolution display at 227 ppi. The company also claims that the Lifebook UH90/L, which crams a 14-inch touch-sensitive display into a standard 13-inch form factor, is the thinnest of its kind, measuring 15.5mm at its thickest part. Delving into the device's guts reveals Intel's 4th-Generation Intel Core i5-4200U 'Haswell' processor and a hybrid 500GB hard drive that combines solid-state storage with a mechanical disk drive. It also runs Windows 8, should you want it to. 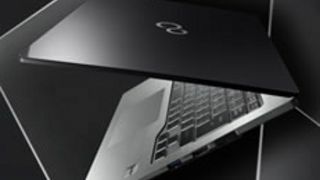 The ultrabook is hitting the Japanese market on June 28. No word yet from Fujitsu on the question of wider availability.